An Automatic Teller Machine, or ATM for short, is a machine that lets people take out (withdraw) cash from their bank accounts. In the United Kingdom (UK), ATMs are often called cash machines, cashpoints or the hole in the wall. Smaller indoor ATMs dispense money inside convenience stores and other busy areas, such as this off-premises Wincor Nixdorf mono-function ATM in Sweden. An ATM in the Netherlands. The logos of a number of interbank networks to which it is connected are shown. A Wincor Nixdorf Procash 2100xe Frontload that was opened with an angle grinder. ATMs that are exposed to the outside must be vandal- and weather- resistant. 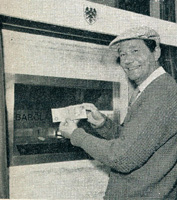 Two NCR Personas 84 ATMs at a bank in Jersey dispensing two types of pound sterling banknotes: Bank of England on the left, and States of Jersey on the right. Gold vending ATM in New York City. Automated teller machine Facts for Kids. Kiddle Encyclopedia.